Once again, I’m copying Trader Joe’s. They have a peanut butter with flax and chia and it’s a fantastic way to get some extra nutrition into a picky eater. Here’s my school-safe version! I have a confession to make: I go back and forth between caring A WHOLE LOT about M’s nutrition and then feeling like there are a million little struggles every day and I don’t want to add food to that list. And he’s always been a contrarian with FOMO, which means he doesn’t love limits. The “perfect parent” voice in my head constantly beats me up about not being stricter. Don’t get me wrong, I say “no” to things 100 times a day and we obviously set lots of boundaries. But we’ve figured out that M does better when he has choice within those limits and that we have to say “yes” to some things or there will be a meltdown. Anyway, part of M’s way of gaining control these days is that he has VERY strong opinions about food. What he loves one day, he hates the next. Peanut butter mixed into applesauce has been a constant and lately he’s been really into PB&J’s after watching this silly video. BUT we can’t send any nuts to school, so sunflower seed butter it is. Unfortunately, a lot of the store-bought ones don’t taste great. 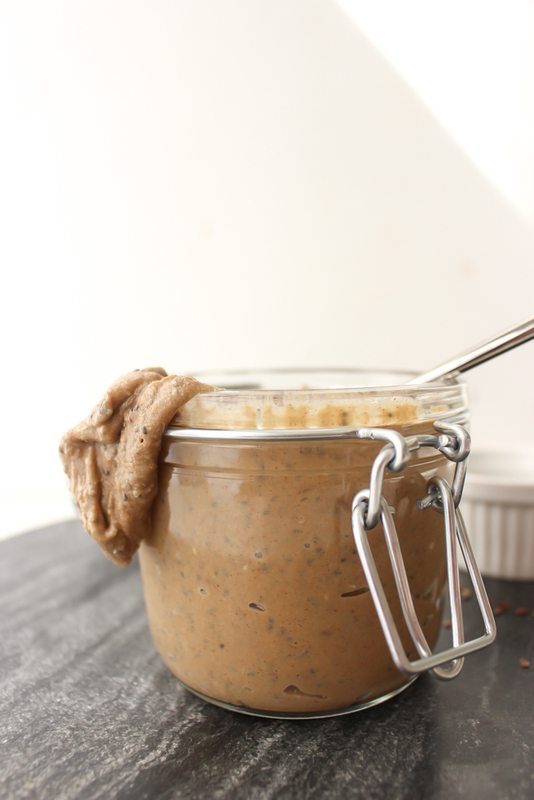 I’ve made my own sunflower seed butter before and I do love this recipe. But if M’s eating this for at least one meal per day, I wanted to beef up the nutrition. And it tastes so good, he doesn’t complain! When roasting the nuts, you want them to be mostly brown and golden rather than gray. But watch to make sure that they don’t burn! (See the photos above for a before and after.) Well-roasted seeds are much easier to process than ones that are still partly raw. The grinding process takes a bit of patience. If you let the machine run, the seeds will come together into a paste. There are more detailed instructions for the individual grinding steps in the recipe below. Be sure to read the recipe before starting this butter. Storage: I store this seed butter in the fridge because I’ve read that flax and chia (and seeds in general) tend to get rancid quickly when left vulnerable to moisture and heat in the cabinet). The cold tightens the butter considerably, but 20 seconds in the microwave makes the butter easily spreadable again. Preheat the oven to 350. Spread the raw sunflower seeds out on a large sheet pan. Roast for 5 minutes and shake the tray. Roast for 2-3 minutes more, checking to make sure that the seeds don’t burn. When the seeds are uniformly more golden brown than gray, they’re ready for processing. Add the roasted seeds to a large food processor and grind for 2 minutes. The seeds will break up and look very dry and like breadcrumbs. Add 2 Tbsp of coconut oil and the maple syrup and process for 2 more minutes. At this stage, the seeds start coming together in a large slow-moving glacier of seed butter. Scrape down the sides and break up the glacier as necessary. It will still feel dry and crumbly when you break up the glacier. Add the vanilla and cinnamon and process again, this time letting the machine run. Let it go for at least 3-4 minutes before adding more coconut oil as the heat of the processor and the continued grinding will start to make the butter smoother and wetter. The glacier of seed butter will still be forming, but will be spinning around the food processor much faster. After that 3-4 minutes, and while the food processor is running, add the other 2-4 Tbsp of coconut oil to achieve a silky consistency. Don’t add more maple syrup or water because it will make the seed butter stick together and clump more instead of smoothing it out. The whole process of grinding the seeds into a smooth butter usually takes between 15 and 20 minutes (including stopping add ingredients), so patience is key. Transfer to a large bowl and stir in the sea salt, chia seeds and flax seeds and stir well. Guys. I have tried and tried to make actually good, lower sugar, school-safe granola bars. I succeeded with these bars, but they're a bit more effort than I'm willing to expend when I suddenly realize on a week night that we don't have anything for snack or lunch boxes the next day. These granola cups are super easy, but we're entering that sweltering season where turning on the oven is basically just opening the gates of hell. Instead we have these no-bake granola bars that are super quick and easy (and cool) to prepare, are lower in sugar than store bought bars, are free of dairy, nuts, gluten, and eggs AND are absolutely freaking delicious. 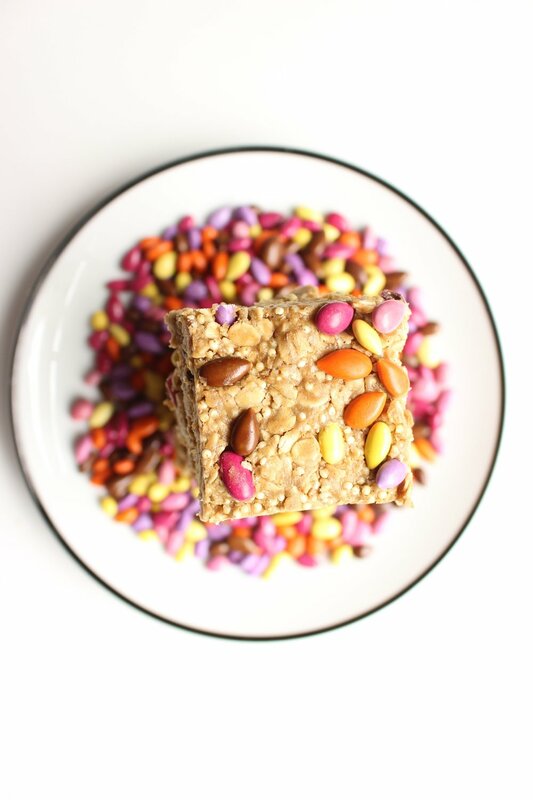 I've tried a couple of no-bake granola bar recipes via Pinterest that left me wanting. Some recommended using quick oats, which got lost in the honey and nut butter mixture. Some also suggested rice cereals that lost their crunch when mixed with the other ingredients. Many of them also call for dates, which I tried in these bars too. Here's the thing: If you use enough dates, they do help the bars stick together when they heat up. But, your bars taste primarily like dates, which I didn't want for this recipe. So, just beware that these bars are ever-so-slightly crumbly when they heat up. - The texture of these bars can change based on a few factors: First, nut butters separate, especially in the heat, so the thoroughness of your mixing can change the texture of these bars. Try your best to mix vigorously so that your nut butter isn't too thin or too thick. - You should be able to form the mixture into a ball that stays together and doesn't stick to your fingers. If the mixture is too crumbly, add one Tbsp of nut butter at a time and mix again to see if the grains come together. If the mixture is too sticky, try adding 1 Tbsp of oats at a time until you have a better consistency. - Give the dry ingredients a good stir before adding in the wet ingredients. The mixing of the wet and dry ingredients can require some elbow grease, but is easier if you've already distributed the grains and cinnamon. - To make these bars school safe, use sunflower seed butter. If you don't have nut or peanut restrictions, peanut and almond butter are perfectly great substitutes. - If you can't find or don't want to use the chocolate-covered sunflower seeds, any old chocolate chips or carob chips (we're particularly fond of these non-dairy chocolate chips), will do. - Millet is a slightly more exotic ingredient, but it's available at Whole Foods or health stores and really helps these bars to have some crunch. Millet is also gluten free and has a ton of health benefits. Combine the dry ingredients in a large bowl and give them a stir. Add the sunflower seed butter and the honey and stir to combine. You can zap these ingredients in the microwave to loosen them up a bit first, but I find that a little elbow grease and some wet hands do the trick. Add the chocolate covered sunflower seeds or chocolate chips and stir again just until they’re incorporated. Dump the mixture out into a parchment-lined brownie pan (I like 8x8 best for the size of the bars it produces, but 9x9 or larger will also work with thinner results). Freeze for 20 minutes. Remove the bars and cut them into 16-24 portions. Store in the fridge. Speaking of scary: I count myself so incredibly lucky that M doesn't have any food allergies. He's outgrown the tomato sensitivity he had early on, but that was an annoyance, not a life-threatening emergency. I can't even imagine worrying that a farmer, factory-worker, chef, teacher, babysitter, or other parent somehow mislabeled something or included an ingredient that could really hurt my kid. Especially from mid-October to January, there are treats everywhere! In that vein, these Halloween goodies are nut-free and egg-free and can easily be made gluten- and dairy-free as well. The chocolate is all store-bought, so use your go-to brands to be safe. ALSO- and most importantly- these treats are SOOOOOOOO GGGGOOOOOOODDDDD and relatively healthy! Heat the chocolate in the microwave, 10 seconds at a time, until melted. On a plastic wrap covered plate, make nickle-sized circles or ovals of melted chocolate. Carefully place the skull and bone sprinkles into the chocolate. Refrigerate until set. Combine the dry ingredients in a small bowl and whisk to remove lumps. Add the wet ingredients and stir to combine. Pour equal amounts into two ungreased mugs. With one mug at a time, microwave on high for 1 minute, check for doneness, and cook for 30 more seconds. (Note: we have a very weak microwave, so if you have a stronger one, check after 30 seconds. I usually tip the cup around to see if anything is moving.) When cakes are cooked, use a fork to remove them from the mugs and let them cool on a plate. Don’t worry about removing them cleanly, as they’ll be broken up for the “dirt” in the graveyards. Let cool. 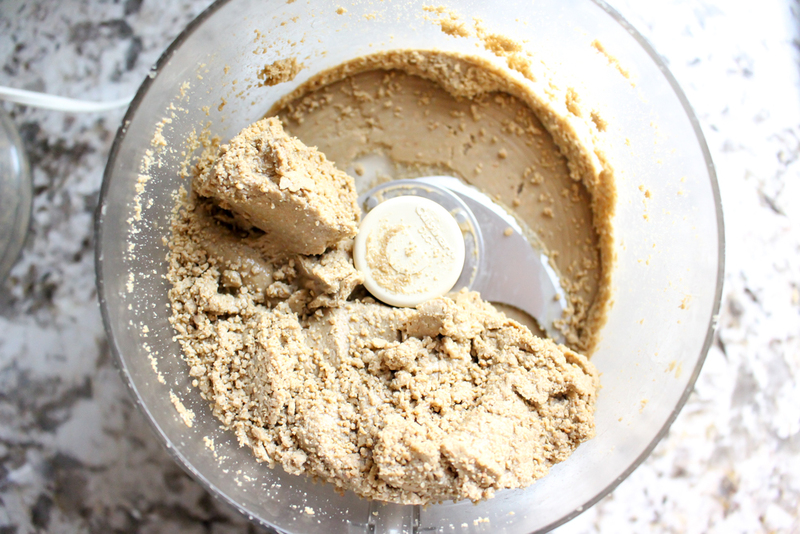 Combine all of the ingredients in a food processor and blend until smooth and creamy. If making the Spiced Seed Butter specifically for these graveyards, be sure to read the directions and follow them exactly. You won't be sorry; this seed butter is GREAT. Makes about 1.25 cups of pudding. Remove the chocolate skeletons from the fridge to warm up. Pour a few chocolate rocks on the bottom of your graveyard container(s). (Possible substitutions include chocolate-covered raisins, chocolate chips, carob chips, or you could skip this part entirely.) Nestle your chocolate skeleton(s) on the side of the glass container, pressing gently to try and mold the chocolate to your container (or skip this step too for allergen sensitivity, if needed). Crumble the chocolate cake completely and gently add a layer of cake crumbles, pressing down lightly. Be sure to keep the cake crumbles behind your chocolate skeletons, if using. Add a pudding layer and press gently to remove air bubbles. Clean up the sides of the glass container. Cover with more cake crumbles. For the graves: Roll out a small amount of gray or white fondant using powdered sugar to prevent sticking. (I bought a tiny container of Wilton gray fondant at Michael's and threw away the box before checking the ingredients and can't find the information online. If fondant isn't an option, gluten-, dairy-, and/or egg-free cookies or marshmallows also make good "graves.") Cut out a very small square and tap with your fingers to round the corners. With an edible pen, melted chocolate, or gel frosting, write RIP on the grave and nestle into the cake crumbs. Place a crumb or two behind the grave to prop it up.